Red chalk, 36 x 26.2; laid down; no wm. visible. 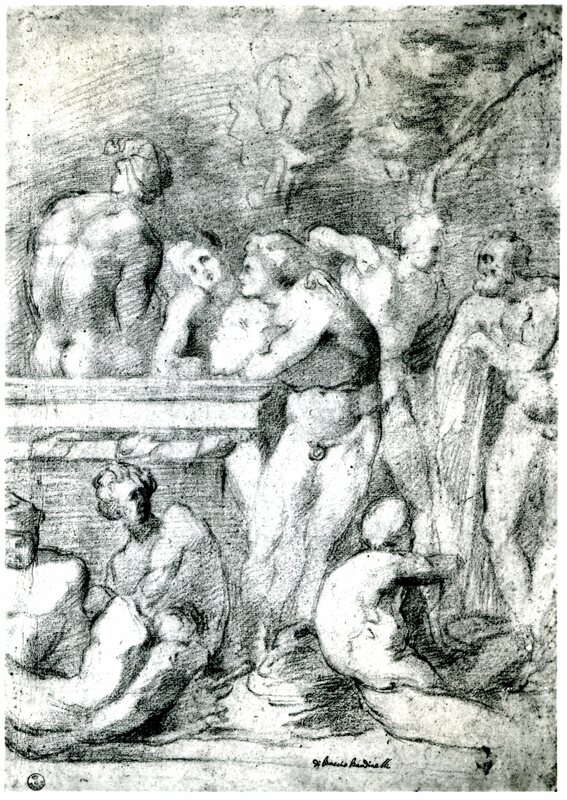 Inscribed in ink at the bottom, but cut by the edge of the sheet, probably: Baccio Bandinelli (see COPIES below). Ferri, 1890, 124, as Rosso. Berenson, 1903, no. 2401, Pl. CLXXI; 1938, I, 323, II, no. 2401, III, Fig. 1009; 1961, I, 471, II, no. 2401, III, Fig. 999, as Rosso. Ferri, 1917, no. 16, as Rosso. Kusenberg, 1931, 136, 139, no. 9, as Rosso, 1523-1527. Venturi, IX, 5, 1932, 216, 220, Fig. 125, as Rosso. Mostra del Cinquecento, 1940, 57, as Rosso. Becherucci, 1944, 27 (1949, 28), Fig. 68, as Rosso. Barocchi, 1950, 206-207, Fig. 186, as Rosso, in the Roman period. Marcucci, in Mostra di disegni, 1954, 23-24, no. 33, Fig. 14, as Rosso, late in the Florentine period, or more likely at the beginning of the Roman period. Marcucci, in Het Eerste Manierisme, 1954, 43, no. 48, Fig. 16, as above. Sinibaldi, 1960, 17, no. 90, as Rosso. Carroll, 1964 (1976), II, Bk. 2, 452-453, F. 5, 542, Bk. 3, Fig. 142 recto, as Bandinelli, possibly in the late 1520s. Ward, 1982, 211, no. 40, as Bandinelli, but not with full confidence. Florence, Figura, 1, 1991, 477F, with Fig. (recto) and bibliography, as Rosso. 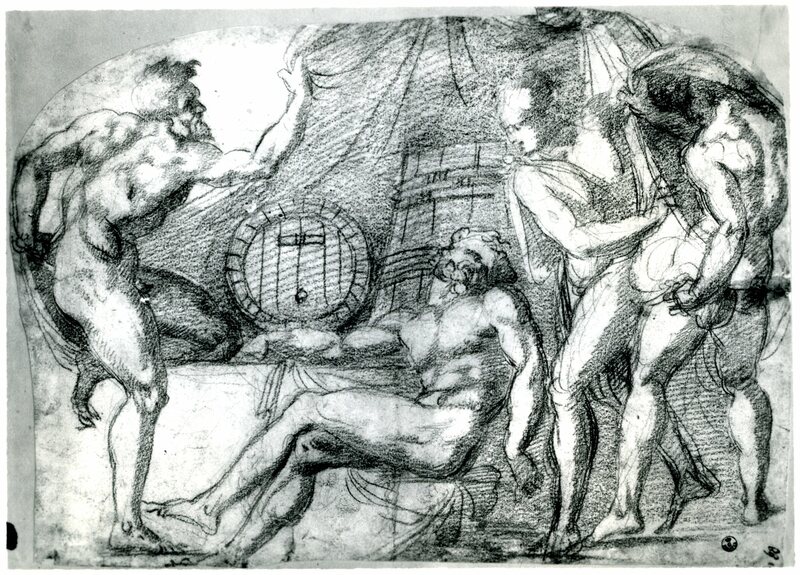 In 1964 I attributed the drawing to Bandinelli and thought that graphically it could be compared with his red chalk study for his copy of the Laocoön in the Uffizi (14785F)1 and his red chalk Drunkenness of Noah (Fig.Bandinelli, Noah) in the same collection (6912F),2 although these drawings are widely separated in time. Because of references to Michelangelo’s sculpture of the Medici Chapel I thought the drawing was possibly done in the late 1520s. Ward catalogued it as Bandinelli’s in 1982, indicating, thereby, that he did not believe it was by Rosso, but he felt less certain than I had that it was by Bandinelli, for whom he found it atypical. 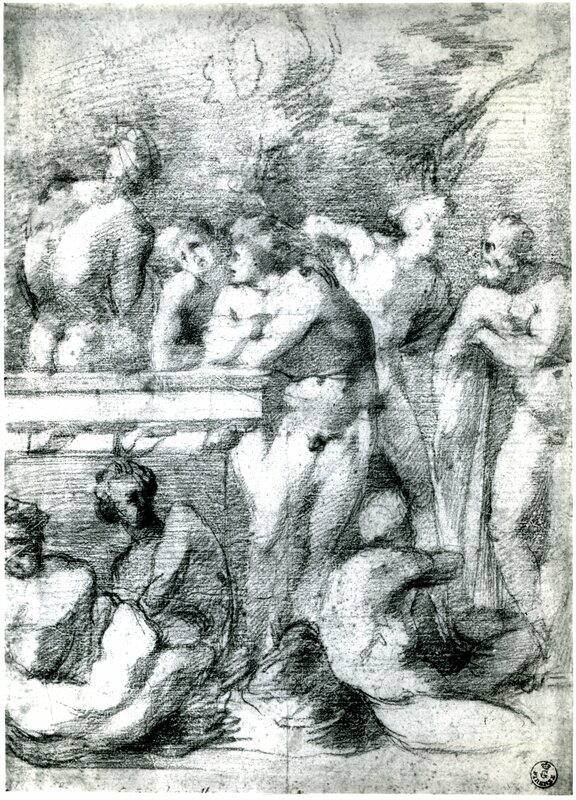 Hence, while the drawing is not by Rosso, none of whose certain drawings resemble this one, it may be reasonable to see the drawing now as Bandinellian and as by the sculptor or by someone closely associated with him. The verso, known from a copy (see below), would seem to be by the same hand. COPIES: Florence, Uffizi, no. 1027S recto (Fig.RD.7 recto, copy) and verso (Fig.RD.7 verso, copy). Red chalk, 39.9 x 27.9; wm., a sunburst in a circle with an H in a center circle. Inscribed in ink at the bottom of the recto: di Baccio Bandinelli. Carroll, 1964 (1976), II, Bk. 2, 453, under F. 5, III, Figs. 143-144. Florence, Uffizi, no. 1028S, recto and verso. Red chalk, 39.9 x 27.9. These drawings are counterproofs of Uffizi no. 1027S recto and verso. Carroll, 1964 (1976), II, Bk. 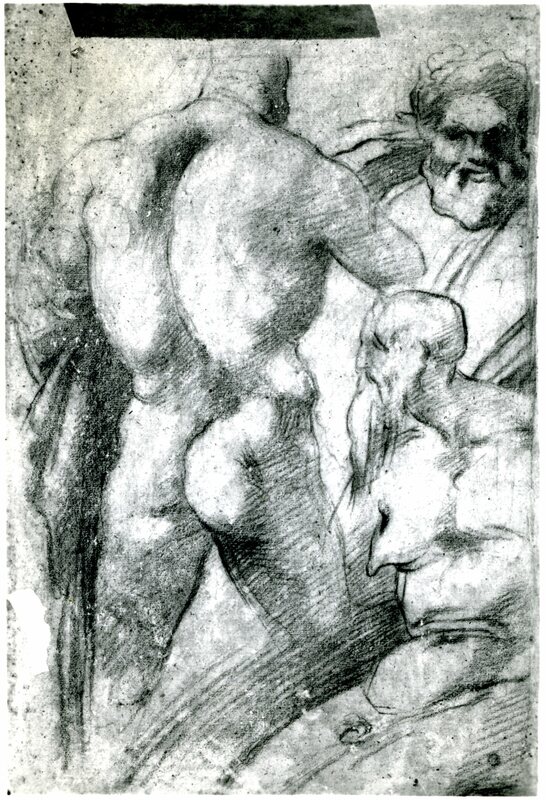 2, 453, under F. 5.
as Bandinelli, early 1520s. Marcucci, 1954, 104, Fig. 9. 2 Ward, 1981, 6-7, Pl. 1, and Ward, 1982, 242, no. 106, App. 1/Pl. 1, as Bandinelli, 1559-1560.